YPC4000 is a combination Calibrator / HART Communicator that reduces the time spent on field calibrations and the number of test instruments that have to be carried into the field. The YPC4000 Series delivers the versatility of a modular calibrator and the convenience of HART communications in one handheld unit. Users can view up to four measurements simultaneously on the high resolution LCD or compare HART PV and AO values to corresponding values measured. Available sensor modules include a variety of differential, gauge, vacuum and absolute pressure as well as voltage, current and temperature. A voltage and current meter is integral to the base unit. All HART field devices can be configured, polled, and trimmed using HART communications. Device Specific commands for more than 200 supported devices, including EJA/EJX pressure transmitters, YTA Temperature Transmitters, and Yewflo are available. 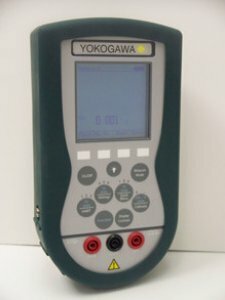 *This product is handled by YOKOGAWA CORPORATION OF AMERICA in US. Please contact through your local Yokogawa's representative. 9.00" L x 4.70" W x 3.58" D ABS plastic case with shock absorbing boot, 28 ozs, three bays for measurement modules. 128 x 128 pixel graphic display, 2.6" x 2.6" viewable area, 5-digit resolution. POWER: 6 AA alkaline or NiMH batteries; 100 - 240 Vac power adapter. Electrical: Std. banana jacks (3/4" center) for ±50 mA/Volts, HART & Loop leads. Data transfer: DB-9 for RS-232C. Pressure: ± 0.025% to ± 0.10% of F.S including all effects of linearity, repeatability, hysteresis and temperature within the range 23°F to 122°F. Current / Voltage: ± 0.025% of F.S. ± .001% of Span per °F (ref. temp. 70°F). 2.3" L x 1.3" W x 2.6" D, 8.3 ozs or less. Positivelock with spring latch. Depress latch to release. Electrical connections are PC board contacts to spring loaded receivers on base unit. Dummy modules protect any empty bay(s).